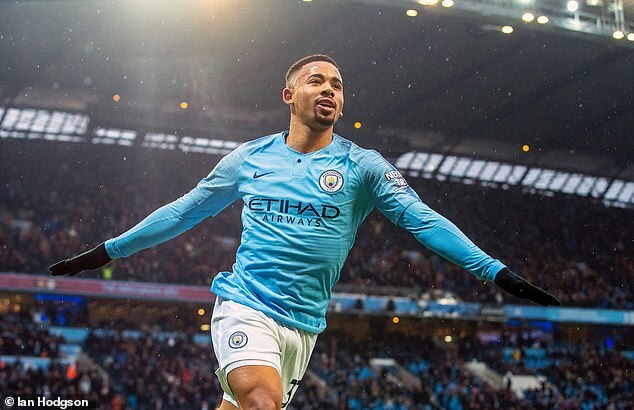 Gabriel Jesus answered his critics as Manchester City overpowered Everton to get back to winning ways in their Premier League title defence. The Brazilian struck twice as the champions ran out 3-1 winners at the Etihad Stadium on Saturday, banishing any hangover from the previous week’s first league defeat of the season at Chelsea. It was a good response from the 21-year-old after a difficult first half of the season in which his only previous Premier League goal came in August. Jesus admitted he had needed to deliver, having been trusted by manager Pep Guardiola to start ahead of a fit-again Sergio Aguero. Jesus said: ‘I am so happy with this because I think I need it. ‘I try to play to help my team-mates and in the game against Hoffenheim I think I played well but didn’t score. But that is football, that is a striker’s life. Jesus, who began the season on the back of a disappointing World Cup with Brazil, looked a more confident player than he has in recent months. He confidently fired the opening goal under Jordan Pickford after a poor clearance by Everton and doubled his tally with a powerful header. Both goals were created by Leroy Sane. Everton pulled one back after the hour through Dominic Calvert-Lewin but City substitute Raheem Sterling wrapped up the points. Jesus put his increased confidence down to the support of his family. His mother has joined him in Manchester while other family members, including two brothers, have been visiting. ‘My family is here and they helped me a lot,’ Jesus said. Jesus believes City have quickly got the Chelsea result out of their system. Everton were well organised in their approach but were ruthlessly punished for any sloppiness by City. They also rallied well in the latter stages but were not clinical enough to make their hosts uncomfortable. Manager Marco Silva said: ‘We showed strong character again. We brought it back to 2-1 and had three clear chances to score goals but we have to score more if we want to get a different result.